With 100% wholegrain oats. High fibre. Low salt. Low saturated fat. Suitable for vegetarians. Contributes to a Healthy Cholesterol Level* *Oat beta-glucan has been shown to lower/reduce blood cholesterol. High cholesterol is a risk factor in the development of coronary heart disease. With the goodness of 100% wholegrain oats, Oatibix is a brilliant way to get all the rich goodness of oats at breakfast time and help maintain a healthy heart. The wholegrain oats packed into each biscuit mean that every bowl contains beta glucan from the natural oats to help contribute a healthy heart. 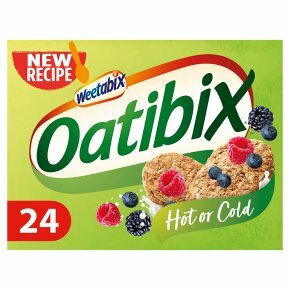 Oatibix is fantastic on its own with lashings of cold or hot milk. Or if you're in the mood for a twist, try adding chopped fresh or dried fruit. Experiment with some flavours of your own and see what works for you.